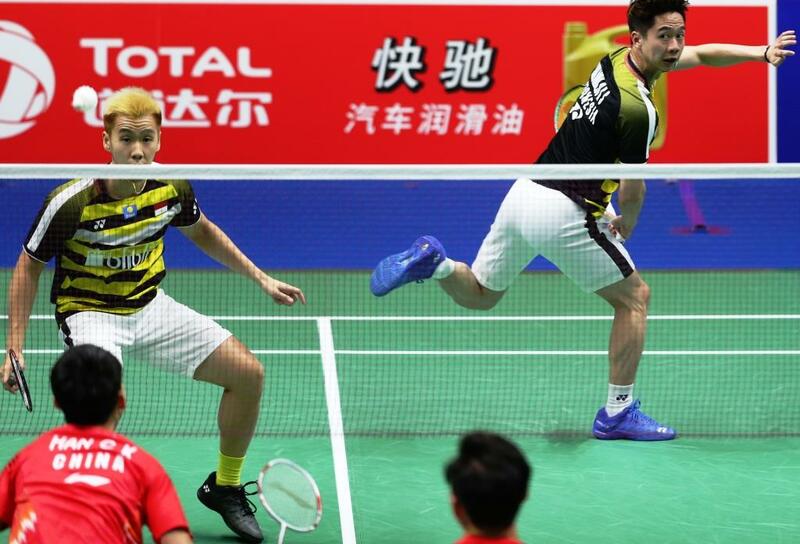 Men’s Doubles titans, Marcus Fernaldi Gideon and Kevin Sanjaya Sukamuljo, needed every bit of wizardry – and some luck – to fend off a fiery challenge from China’s Han Chengkai and Zhou Haodong today at the TOTAL BWF World Championships 2018. 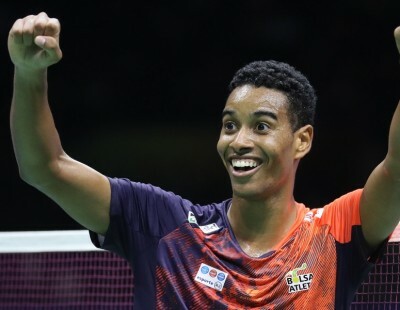 The Indonesian top seeds scraped into the third round, thanks to steadier nerves and an incredible rear-guard comeback that ultimately brought them victory: 18-21 21-14 21-18 in 52 pulsating minutes. 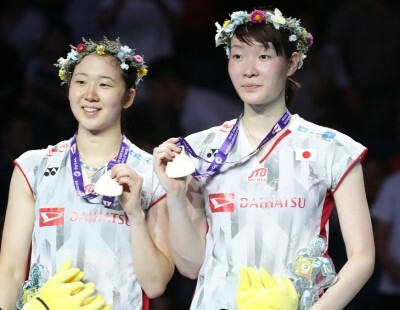 However, their quest to add the World title to their astonishing success was almost upended before it began by the 2016 World Junior champions whose firepower is a stand-out feature of their promising partnership. 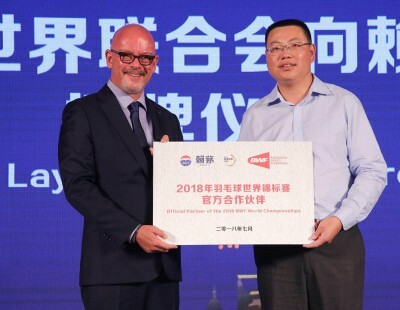 Playing freely and without the pressure of expectation, the big-hitting pair went on the offensive versus the world No.1 top guns, upsetting the rhythm of the usually-smooth operators and wresting the first game to the delight of spectators in Nanjing, China. 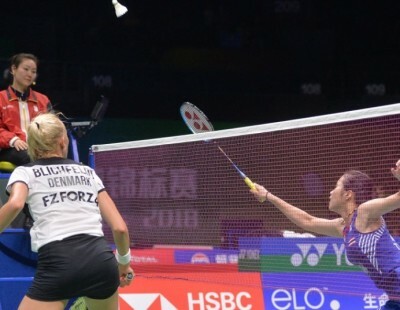 Like true champions, the Indonesians responded admirably in the second game, digging in during lengthy rallies and exploiting moments of indecision and nervousness by their rivals to even the score sheet at a game apiece. The battle was far from over though as the underdogs kept firing away; their attacking onslaught earning them an 11-7 advantage at the mid-game changeover. Noisy spectators screamed support, mostly for the Chinese – urging them to press for on. Gideon and Sukamuljo clawed back though, seizing five straight points to take the lead 12-11. From there, it was a neck-and-neck tussle to 16-16. 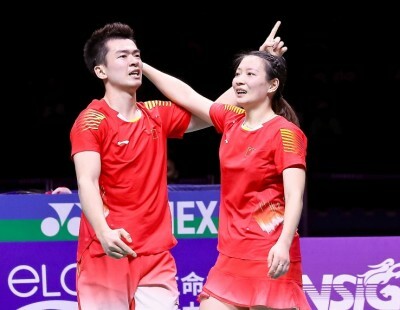 A few late errors – and a vital misjudgement that saw Sukamuljo’s defensive push float in near the sideline to bring up match point – hurt the Chinese. 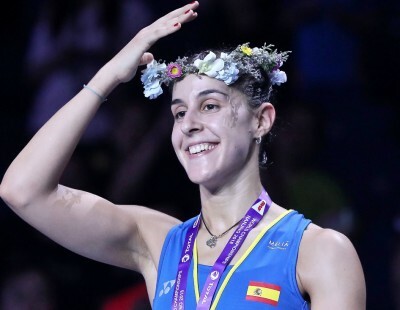 In the end, it was not to be and the favourites sighed in contemplation of the third round versus Russia’s Vladimir Ivanov and Ivan Sozonov. “It was not easy to beat them. We didn’t play our best and we were searching for the right way to play against them,” said Gideon. His partner credited their ability to focus in the dying stages of the decider, noting “it was a lot of pressure but we kept fighting”. 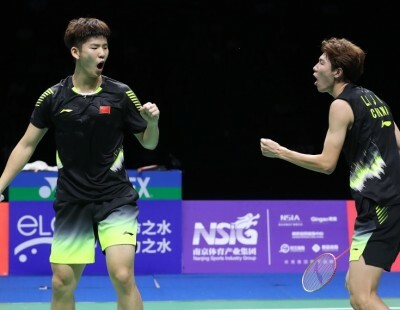 Though thwarted Han/Zhou were pleased to have performed well against the stellar duo, stating “We did the best we could but we lack their experience. They waited for us to make mistakes”. “They had good speed, consistency and mental strength. At the critical moments, we were eager to win and we were nervous. We were pushing too hard and we made some mistakes,” said Han. 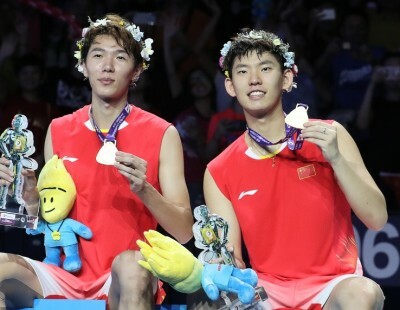 Elsewhere in the category, Aaron Chia and Soh Wooi Yik continued to improve their credentials, beating No. 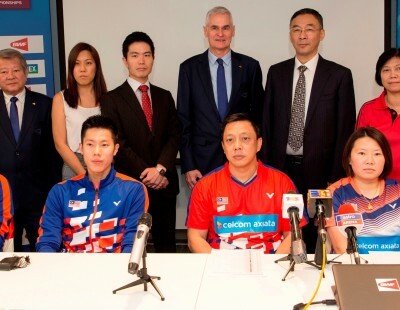 12 seeds, Lee Jhe-Huei/Lee Yang of Chinese Taipei. Having accepted a late invitation to the tournament, the Malaysians enjoyed a tough 16-21 21-18 21-19 win to reach the third round. They were joined by team-mates, Goh V Shem/Tan Wee Kiong who brushed aside Ong Yew Sin/Teo Ee Yi, 21-16 21-15, in an all-Malaysia match. 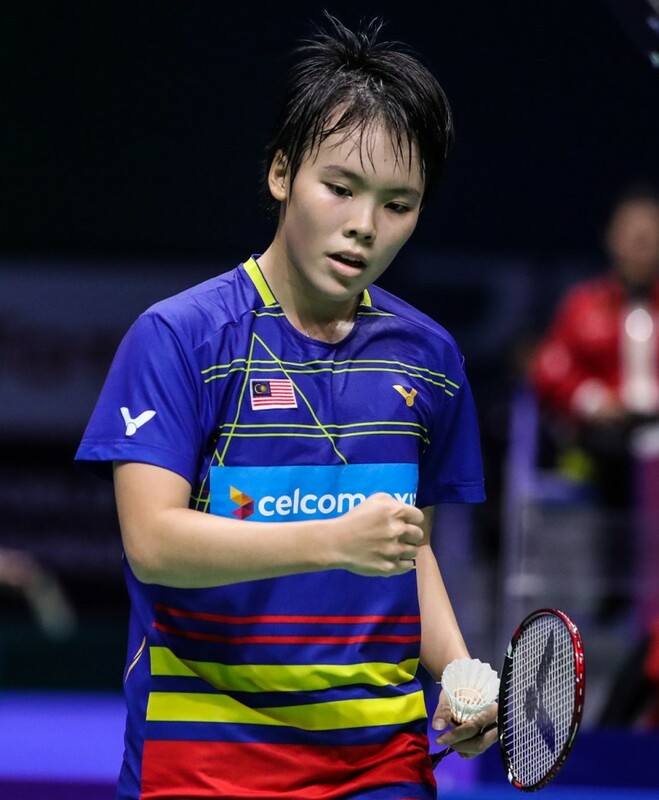 Malaysia’s jubilation extended to Men’s Singles (Liew Daren), Women’s Singles (Goh Jin Wei), and Chow Mei Kuan/Lee Meng Yean (Women’s Doubles). 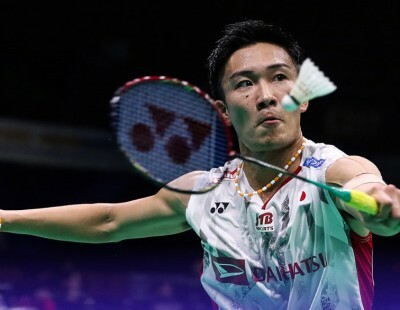 Liew earned a third-round clash versus Kidambi Srikanth, cruising by Misha Zilberman of Israel (21-16 21-16) while Goh put in some good work to oust Japan’s Aya Ohori (21-18 22-20). 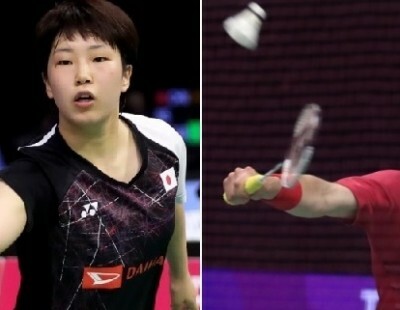 This result set up a first-ever battle with reigning World champion, Nozomi Okuhara; the latter calmly dissecting Canada’s Rachel Honderich (21-11 21-9). “I think I will have to run a lot. 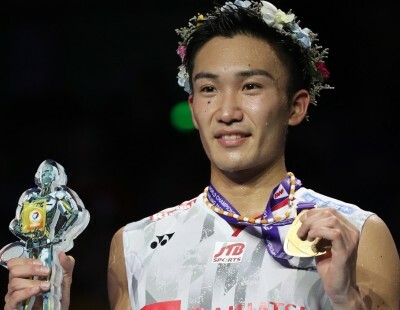 I have to be prepared to play for two hours,” quipped a smiling Goh, musing about Okuhara’s well-known stamina. 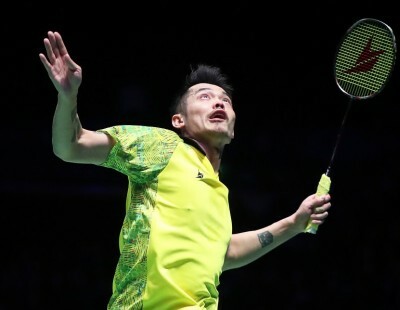 Her 31-year-old compatriot, Liew labelled himself the underdog in tomorrow’s fixture versus Kidambi but he might take comfort from what he observed today as the Indian star lost his way in mid-match against Pablo Abian before tugging the proceedings back into his favour. 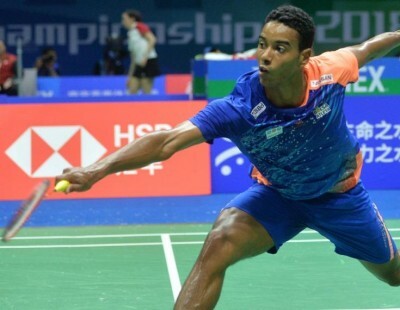 Having taken the first game 21-15, Kidambi stumbled in the second game as an energised Abian threw himself around the court behind every shuttle. 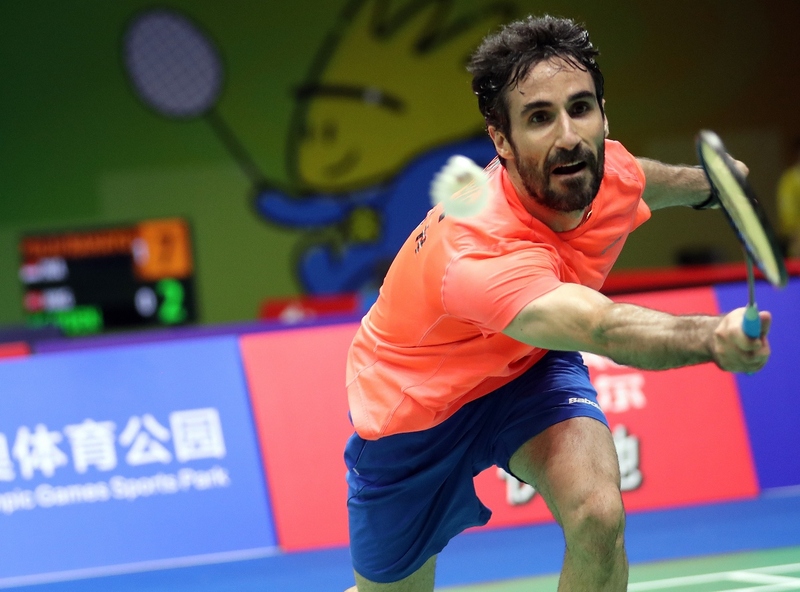 That enterprise earned the Spaniard a third game and he maintained his intensity until the No.5 seed cut into his 10-7 lead and eventually overtook him at 12-12 to secure a 21-15 12-21 21-14 triumph. “I started well but I made too many mistakes in the second game. Probably I was trying too many things and maybe I was too relaxed but (in) the last ten points I got everything right,” assessed 25-year-old. 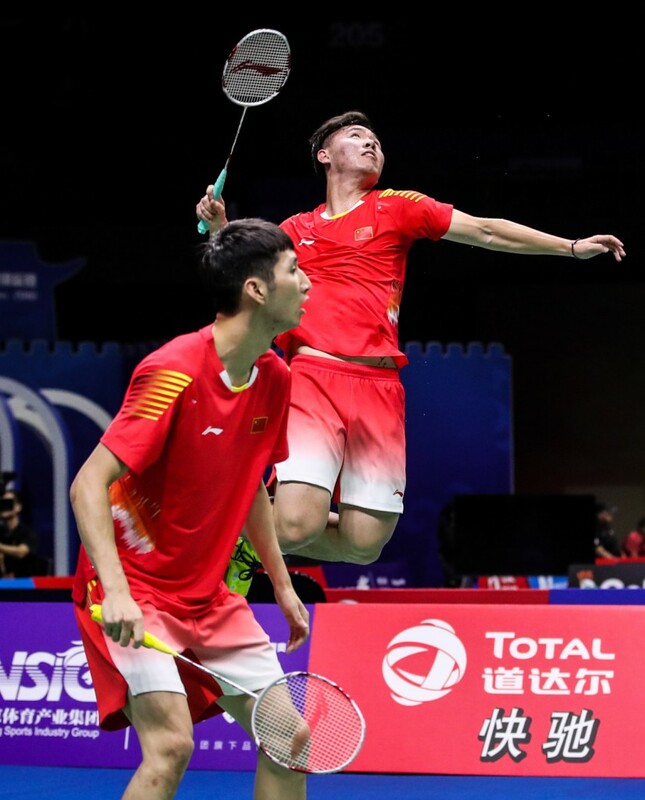 Meanwhile, Men’s Singles World champion Viktor Axelsen survived an early test and a change of court to get past China’s Huang Yuxiang in straight games. At 16-16 in the opener, the match was shifted from Court 1 due to an oily substance dripping onto the edge of the court. When the players resumed, the big Dane powered through 21-17 21-8 to book a spot opposite Hong Kong’s Ng Ka Long. 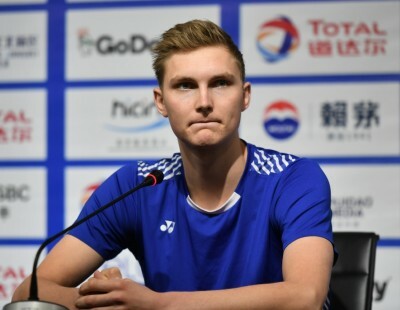 Axelsen’s blossoming countryman, Anders Antonsen, is eagerly anticipating his first battle with Japan’s Kento Momota, having done the business against veteran Vietnamese, Nguyen Tien Minh (21-16 21-18). 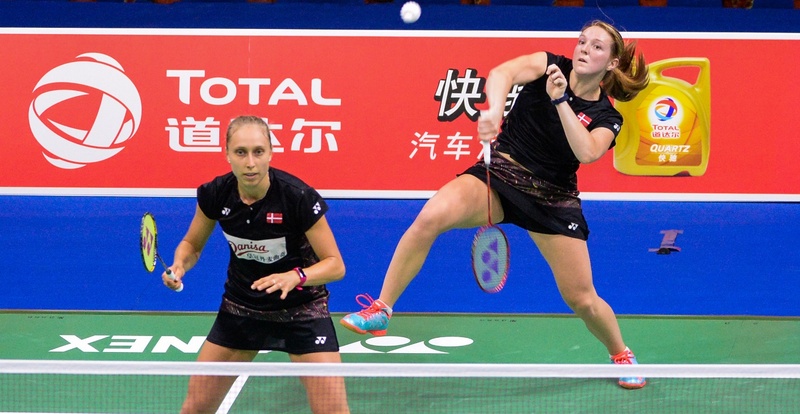 Denmark also savoured a good day at the office in Men’s Doubles, with its three seeded pairs advancing to the last 16 while their Women’s Doubles peers, Maiken Fruergaard and Sara Thygesen, did likewise.